Wear a design that people read and say 'Ouch! '; This little number, though light-hearted may stir some controversy, so make sure your fiancé knows it's just for laughs! 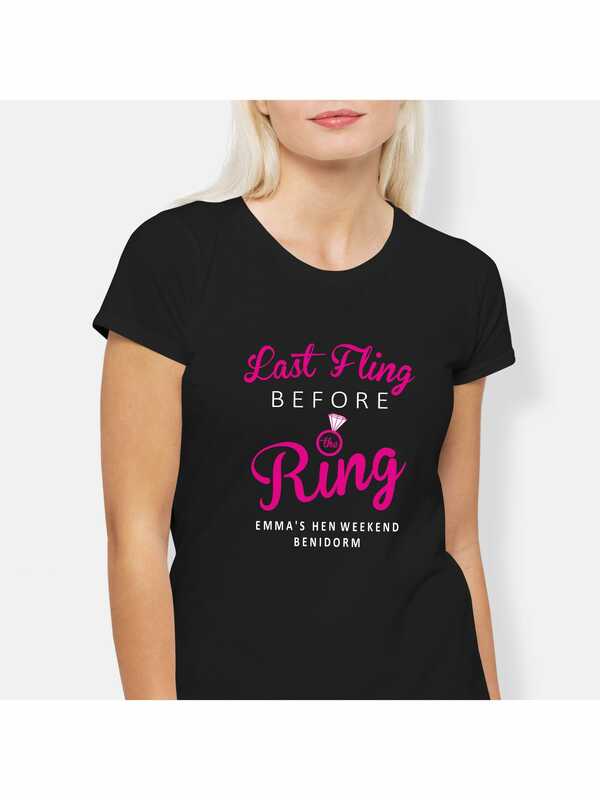 This design features the famous 'Last Fling Before the Ring' hen party saying, and can be customised with your personal details, to make a great keepsake. Showing our 9 Hen Party Superstore Last Fling Before The Ring Hen Party T-Shirts reviews with an average rating of Excellent. Would you like to write a review? Amazing quality. Company were fantastic to deal with. They answered my questions very promptly and I revived my order within 3 days of placing it. I would defenatly recommend to any1.. 10/10 on everything from quality to value for money. Good quality t-shirts and good printing of the text. Review - I ordered a single hen do top for my sisters hen party to see what one would like before i ordered a bunch and it came here within two days of ordering it very fast delivery. Was 100 percent happy with my purchase. And will be ordering more. I ordered a single hen do top for my sisters hen party to see what one would like before i ordered a bunch and it came here within two days of ordering it very fast delivery. Was 100 percent happy with my purchase. And will be ordering more. Review - These tops are perfect for a hen party, however they do not come in the sizes you order. If I would not have got them personalised I wouldn't of been able to tell who's was who's. The sizes are all different and also larger sizes are different style tshirts. These tops are perfect for a hen party, however they do not come in the sizes you order. If I would not have got them personalised I wouldn't of been able to tell who's was who's. The sizes are all different and also larger sizes are different style tshirts.